Google for Nonprofits is currently available in 50+ counties. Successfully enrolling in this program can be rather confusing, due to the sticky policy and technical reasons, so we encourage your organization to contact us if you need assistance. Please note that it can take a couple weeks for your application to be approved for both Google for Nonprofits and Ad Grants. Once approved, you should receive a validation token which is required to enroll in additional non-profit programs. You can also receive free advertising for your nonprofit through Google Search and increase awareness worldwide. Track online donations, newsletter signups, volunteer registrations, ticket sales, and more. The more frequently your ads appear next to Google search results, the more people will be aware of your cause. That can translate into more donations and more volunteers — the lifeblood of every nonprofit. Google Ad Grants work just like Google AdWords online advertising, by displaying your message to people who are searching for nonprofits like yours. If you’re a qualifying nonprofit, you’ll receive a grant of $10,000 USD in AdWords advertising every month. Need Help? Contact Smartz, the brighter digital marketing agency, for assistance. 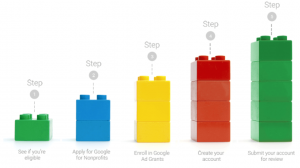 To enroll, you must first be approved for Google for Nonprofits. AdWords Express: Designed for organizations that have limited time to manage their AdWords account. Pick your audience, write three lines of text about your nonprofit, set your daily budget, and let AdWords Express do the rest. AdWords: Designed for organizations that have dedicated advertisers managing every aspect of the AdWords account. If you need an expert to manage your PPC account, please contact us for more information. Not sure where to start or which keywords or locations you should target? Do you know how to optimize your AdWords account based on ongoing performance? Please contact us for assistance. Need consulting assistance? Please contact us for more information.